Monumentum Patarense, also known as Stadiasmus Patarensis, which dates from 46 A.D. and lists all the roads renovated during the reign of Claudius in the whole of Lycia has created a totally new context for answering several questions concerning the administrative history and geography of Lycia. Based upon the inscription on this monument, field surveys of the Lycian road network were initiated by the late professor Sencer Şahin in 2004. 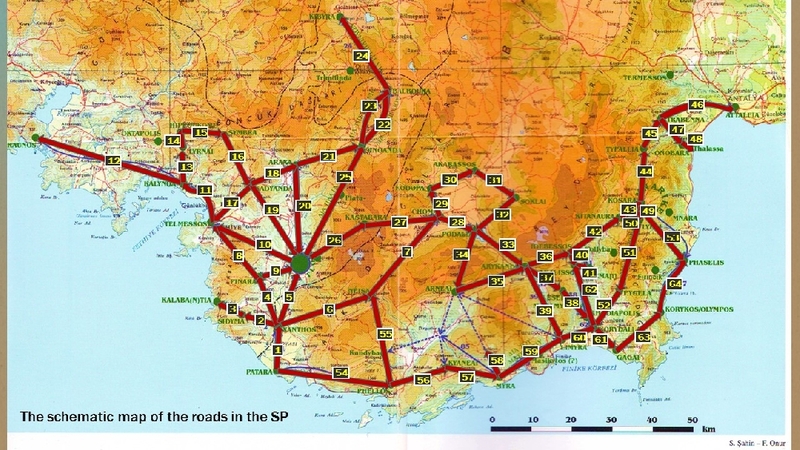 The aims of this survey are determining ancient roads and routes in Lycia and Pamphylia, the evaluation of any sort of data from the field indicating the presence of these roads and routes and of all epigraphical material, published or newly found in the course of the surveys. In consequence of this work, this research investigates settlement distribution and the network connections and aims to produce conclusions concerning the administrative and political history of the region, together with the deeper understanding of its historical geography, to the fullest extent. After Şahin's death in 2014, the field surveys are conducted by Prof. Dr. N. Eda AKYÜREK ŞAHİN. From 2018 onwards, it is headed by Assoc. Prof. Dr. Fatih ONUR. The field work conducted has produced satisfactory results supporting our therotical approaches. These results are published systematically by the team members in various publications.